This is the big waterfall by the first parking lot. Several groups of people were swimming here. This hike was a royal pain. I had a map from the internet, but it didn't have enough detail to actually be useful. There was a kiosk with a map at the park, but it was inexplicably in an inaccessible fenced in area fill of weeds. 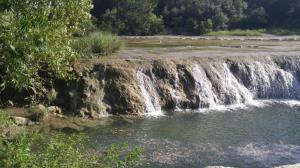 I parked in the first lot, found the very nice, sizeable falls with a bunch swimmers. I followed a trail here until it petered out in the woods, overtaken by poison ivy. Then I backtracked and forded the creek at the road, and found the second parking lot and trailhead. On this side of the creek, what appeared to be the main trail dead-ended unexpectedly in a parking lot and volleyball court. The only marked trail I ever found had become a running creek for about 300 feet, thanks to the recent rains. Other trails dead-ended in the woods or the creek. I never figured out how this trail system would hook up with the St Ed's Park trails. It was hot, short, unbelievably muggy, poison ivy infested, muddy, and unreliably marked. There were some picturesque parts, but I can't say I'll be rushing back to do this again.